At its meeting on the 20th December 2016, the Borough Council of Wellingborough resolved to adopt the Wollaston Neighbourhood Plan, following the referendum on 8th September 2016. The Wollaston Neighbourhood Plan now forms part of the Development Plan for the Borough and will be used to help the Borough Council decide on planning applications in the neighbourhood area alongside existing planning policies and their successors. It is anticipated that the Development Committee of the Borough Council will recommend adoption of the neighbourhood plan at its meeting on 31st October and that the neighbourhood plan will be formally 'made' (adopted) by the full council at its meeting on 20th December. 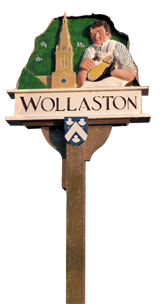 The Wollaston Neighbourhood Plan will then become part of the statutory development plan for Wollaston. Planning applications must be determined in accordance with the development plan, including the Wollaston Neighbourhood Plan, unless material considerations indicate otherwise. Following this successful outcome of nearly five years work the Neighbourhood Plan Steering Group has been dissolved. Monitoring of the Neighbourhood Plan will be undertaken by the Parish Council. The following information sets out in chronological order the stages leading up to the Wollaston Neighbourhood Plan being ‘made’ (adopted) by the Borough Council. Wollaston Parish Council submitted an application for the designation of the Neighbourhood Area on 25th October 2012. The application was approved by the Borough on 9th January 2013. Wollaston Parish Council undertook formal consultation on a Draft Plan between 28th November 2014 and 19th January 2015. Consultation Draft Plan – schedule of representations and responses) - the schedule is included at Appendix 1 of the Consultation Statement (2015) –see download 8 below. Wollaston Parish Council submitted the Neighbourhood Plan to the Borough Council of Wellingborough on 20th October 2015. The Borough Council undertook consultation on the Submission Plan from 4th November 2015 until 18th December 2015. Following this consultation, in March 2016 the Borough Council appointed Mr Richard High, an independent examiner to review the Plan. He concluded his examination in April and recommended that, subject to a number of modifications to the Plan, it should proceed to referendum. Subsequently, at a meeting held on 27th June 2016, the Development Committee of the Borough Council accepted the recommendations in the Examiner’s Report subject to a minor change to Policy T4 (Superfast broadband) which ensured that a planning condition requiring the provision of ducting is applied not only to residential development but also commercial development. They also endorsed the recommendation that the Plan went forward to a referendum. The Borough Council subsequently produced a Decision Statement which includes its review of the recommendations made by the Examiner. The amendments made by the Borough Council were incorporated into the final version of The Plan (July 2016) above. In addition, the Borough Council amended paragraph 1.2 of the Basic Conditions Statement as recommended by the Examiner (13, below). The representations received at the Submission Plan stage are available on the Borough Council’s website: Regulation 16 Representations.